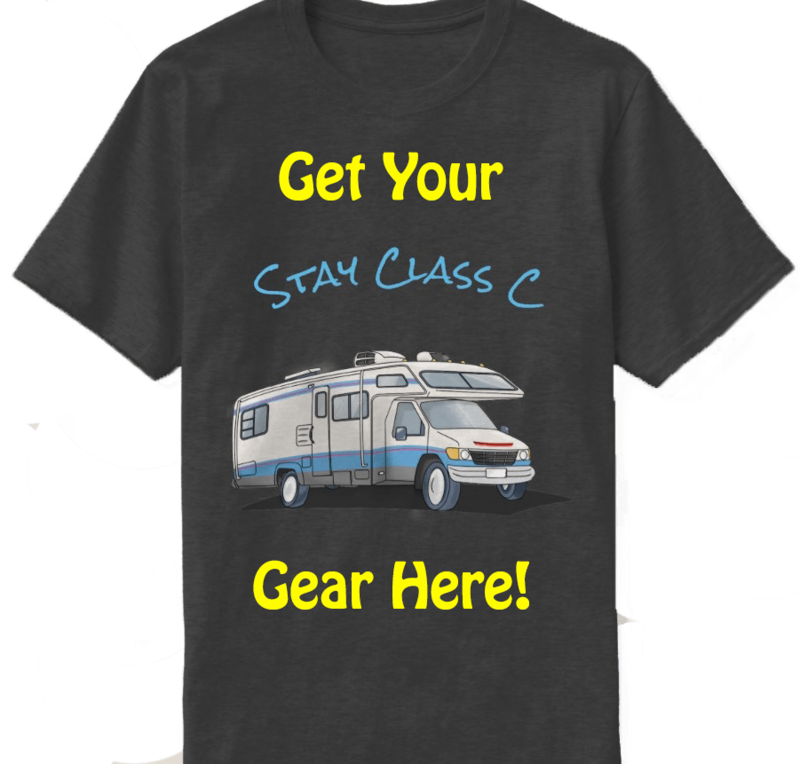 A week had passed since our European adventure began and we were back on the road heading for the next exciting country on the itinerary…Austria! After crossing the border, we passed through the Arlberg Tunnel, Austria’s longest road tunnel, to reach our first destination of the day, the majestic city of Innsbruck. Known as the “Capital of the Alps”, Innsbruck is the capital city of Tyrol, Austria, and a world-class winter sports destination that hosted the Olympics Winter Games twice. The coach dropped us off in the middle of the city’s “Old Town”, and we were immediately stunned by Innsbruck’s unique beauty. Seeing the Baroque/Gothic architecture for the first time was like stepping into a fairy tale. Several colorful buildings lined the main street and the view of the Alps was breathtaking. There were several interesting boutiques and cafes and we followed our noses to a place called Strudel-Cafe Kröll. 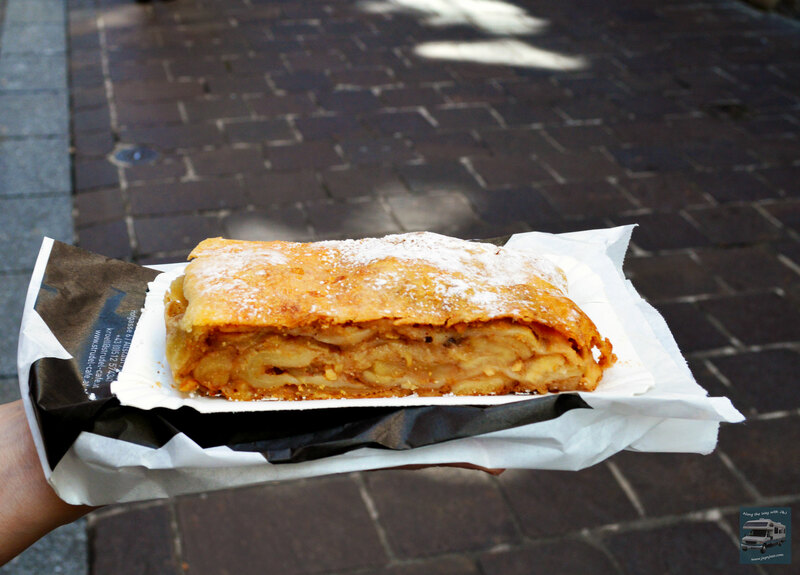 Here, we indulged in a delicious apple strudel and grabbed a “brezel” to munch on while walking. After a bit of shopping , we visited the Swarovski Kristallwelten store, where there are several beautiful Swarovski crystal sculptures on display. We then headed toward Innsbruck’s most famous landmark, the Goldenes Dachl, or “Golden Roof”. Constructed of 2,738 gold-plated copper tiles, the roof is displayed above a balcony once used by Emperor Maximillian I to observe events in the square. We stopped to watch a couple of interesting street performers in the same square before returning to the coach. We arrived in Salzburg mid-afternoon and were greeted by our local tour guide, who was dressed in a traditional Austrian “dirndl”. 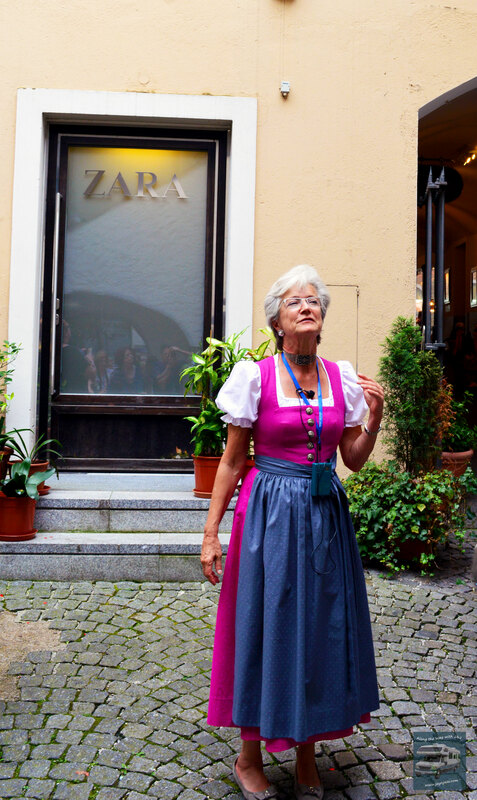 She led us through the heart of Salzburg, which began with a visit to Mirabell Palace and Gardens, where the iconic “Do Re Mi” scene was filmed for the classic film “The Sound of Music”. The courtyard was packed with visitors but we managed to capture a few good shots of the grounds. Next, we crossed the Makartsteg Bridge, a pedestrian bridge over the Salzach River, to reach the historic town center. The bridge is covered with hundreds of “love locks” from visitors all over the world and we had a nice view of Hohensalzburg Castle and Old Town Salzburg. Next, we visited the birthplace of Salzburg’s most famous resident, Wolfgang Amadeus Mozart. The building is now one of the most visited museums in the world and its bright yellow façade, like Mozart himself, stands apart from the adjacent buildings. A short walk later, we were in Residenzplatz (Residence Square), where we paused to admire the Residenzbrunnen (Residence Fountain), the largest Baroque fountain outside of Italy. 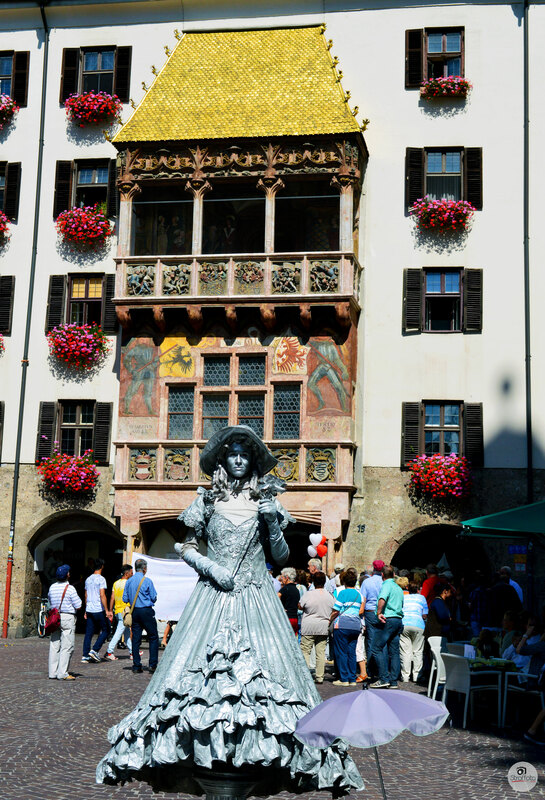 If you’re a fan of The Sound of Music, you’ll remember Julie Andrews’ Maria singing “I Have Confidence” in Residenzplatz and splashing in the fountain. Our guide gave us some free time to find lunch and by now, we were famished! 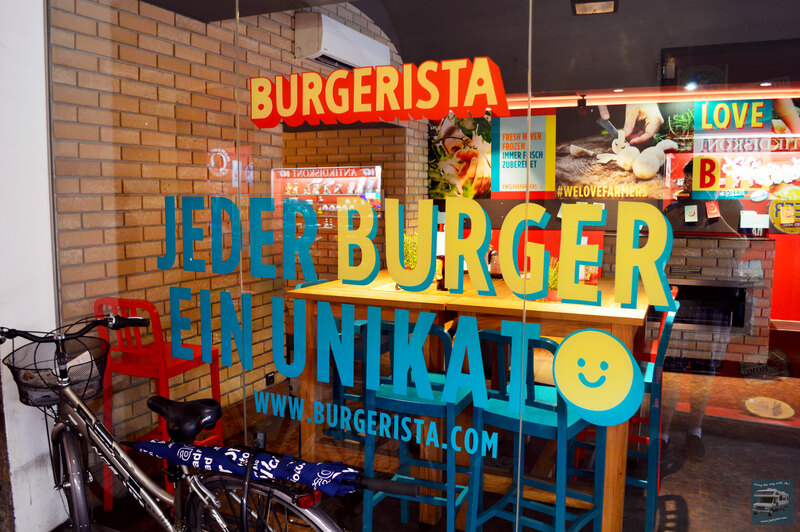 We pretty much chose the first place we came across and lucked out with Burgerista. I ordered the Veggie burger and Jay chose a Route 66 burger. Both were amazing and we enjoyed dipping our steak fries in the variety of Burgerista sauces at our table. After lunch, we met up with the rest of our group at Mozartplatz (Mozart Square), where a bronze statue of Mozart stands in the center and serves as a memorial to the great composer. Several cafes border the square and a few scattered street vendors were selling art and other souvenirs. Our hotel in Salzburg was the ARCOTEL Castellani Salzburg, which is located in the center of Salzburg. After settling in, we ordered a drink and sat in the garden terrace to unwind and reflect on another fascinating day. Check back soon to read about our visit to a historic landmark with a dark past and our arrival in Italy! I always think of AHHHHNOOOLLLD when pondering Austria but it offers a little more LOL. Gorgeous country with amazing food, stunning architecture and fabulous culture. Innsbruck is on the list for sure. This trip looks absolutely incredible!!! I am so jealous! It was Amazing! Keep coming back for more.